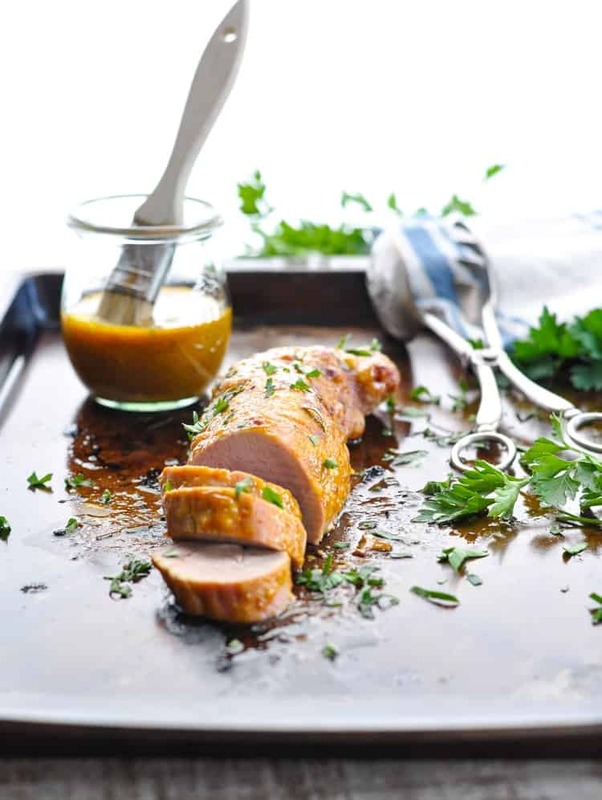 With just 5 basic pantry staples and about 5 minutes of prep, you can prepare a juicy, tender, and healthy Mustard and Brown Sugar Baked Pork Tenderloin! This easy dinner recipe is also high in protein and low in calories! 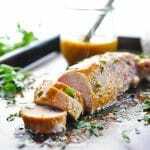 So many of you have loved the Honey Garlic Dijon Pork Tenderloin marinade that I shared last summer, which makes me really happy! But sometimes you need a healthy dinner that comes together in less than 30 minutes, doesn’t require marinating time, and doesn’t use a grill. 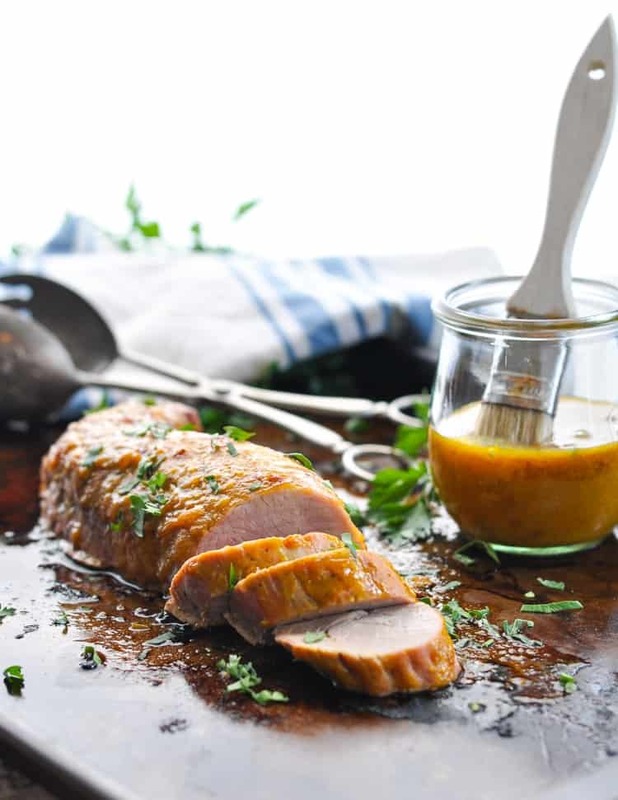 This baked pork tenderloin is cooked in the oven without searing — making it the answer to your prayers! If you feel like you’re stuck in a chicken “rut” for dinner each night, then pork is a great alternative. With a similar mild taste and texture, it’s an easy way to keep the kiddos happy while mixing up the same old routine. 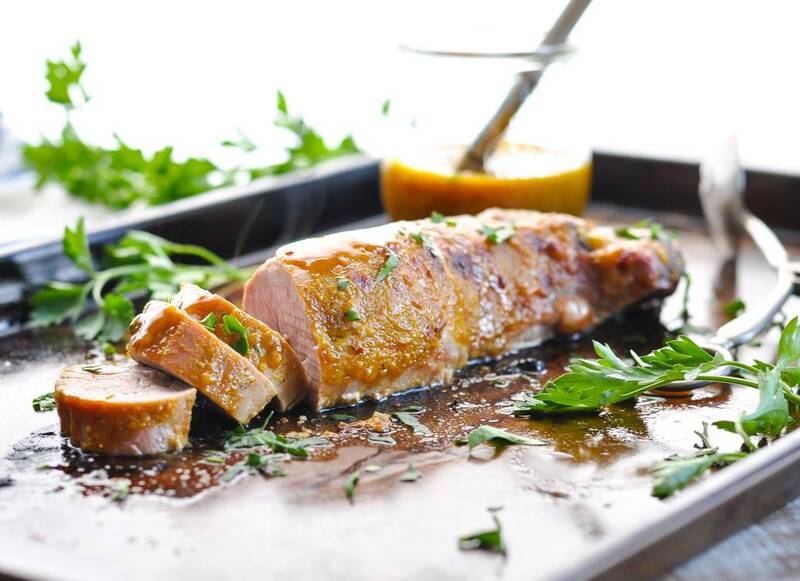 This Mustard and Brown Sugar Baked Pork Tenderloin is such an easy way to prepare a delicious, healthy meal at the last minute. If you’ve got a tenderloin stashed away in your freezer, then you can probably skip a trip to the grocery store (hooray!). 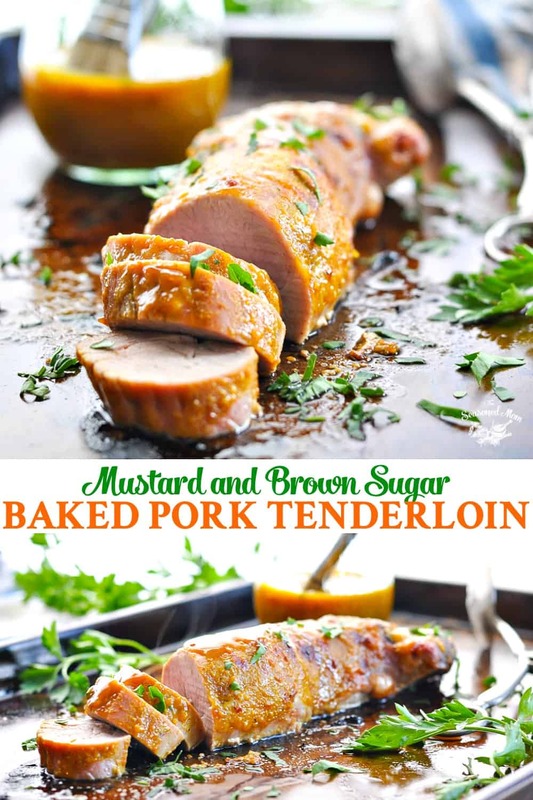 You’ll need the following 5 ingredients: pork tenderloin, brown sugar, mustard (I like to use yellow mustard here, but Dijon is also fine), salt and pepper! Simply combine the mustard, brown sugar, salt and pepper in a small bowl. Pat the pork dry, rub with the mustard mixture, and your job is done! See? 5 minutes of prep! 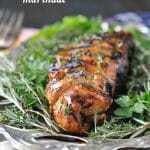 This baked pork tenderloin recipe cooks in a 425 degree F oven for 20-30 minutes, or until the internal temperature of the pork reaches 145 degrees F.
Baking it at this high temperature gives the outside of the pork a nice crispy texture (as the sugars in the sauce caramelize), while the inside stays perfectly juicy! Tent the baked pork with foil and allow to rest for 5 minutes before slicing and serving! 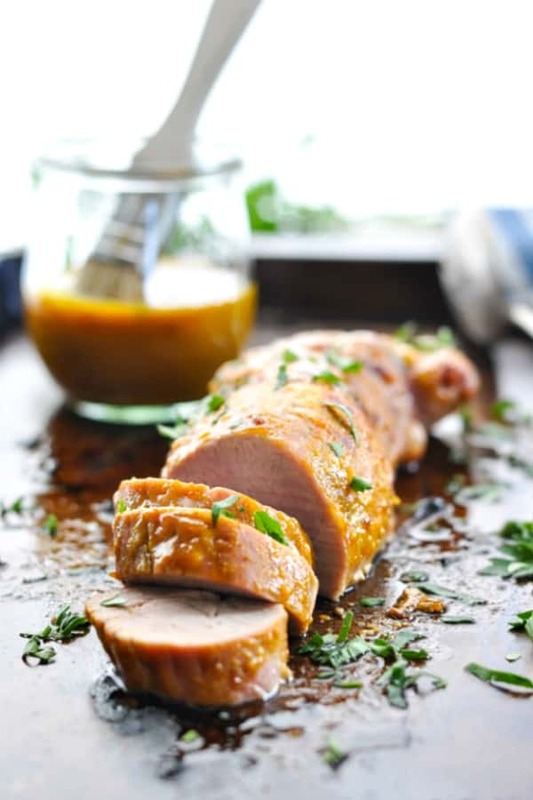 This easy pork tenderloin recipe is so versatile! You can serve it with just about any sides that your family will enjoy — including bread, 3-Ingredient Buttermilk Biscuits, pasta, rice, or couscous. Add a salad, steamed broccoli, or some Southern Slow Cooker Green Beans for a feast that your family will devour. 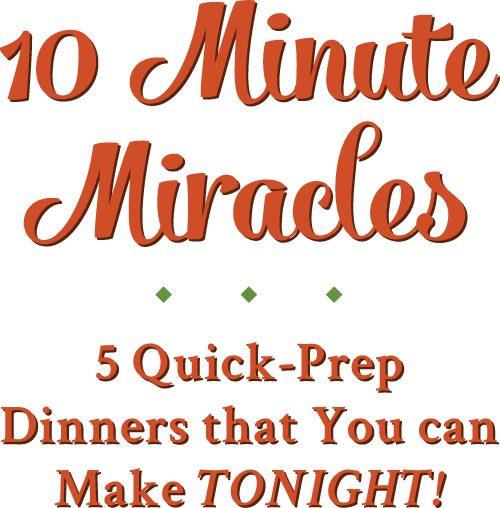 There’s no need to let them in on the secret — that you only spent about 5 minutes preparing the meal! Be sure that you don’t overcook the pork, or it will dry out. I always use a meat thermometer so that I know exactly when the meat reaches 145 degrees F inside. The pork will continue to cook and rise in temperature as it rests, so if you check it and it’s close to 145 pull it out and let it finish on the counter. I often use yellow mustard in this recipe, but Dijon mustard also works well! If you’re cooking for a larger family of 4 or more, I suggest doubling the recipe and preparing two tenderloins. You can bake them side-by-side on the same baking sheet, so there’s no added effort! Just make twice as much mustard glaze. Cooking time remains the same. Prep ahead! You can baste the pork with the sauce in advance and keep the pork covered in the refrigerator until you’re ready to pop it in the oven! In a small bowl, stir together first 4 ingredients (brown sugar through pepper). 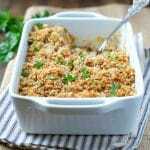 Line a dish or rimmed baking sheet with foil or parchment for easy cleanup. Spray the dish or baking sheet with cooking spray. Place pork on the prepared baking sheet. Pat dry with a paper towel. Rub brown sugar mixture all over the pork. Bake pork for 20-30 minutes, or until a thermometer reads 145 degrees F.
Remove from oven, tent with foil, and allow to rest for about 5 minutes before slicing and serving. Be sure that you don't overcook the pork, or it will dry out. I always use a meat thermometer so that I know exactly when the meat reaches 145 degrees F inside. The pork will continue to cook and rise in temperature as it rests, so if you check it and it's close to 145 pull it out and let it finish on the counter. If you're cooking for a larger family of 4 or more, I suggest doubling the recipe and preparing two tenderloins. You can bake them side-by-side on the same baking sheet, so there's no added effort! Just make twice as much mustard glaze. Cooking time remains the same. Prep ahead! You can baste the pork with the sauce in advance and keep the pork covered in the refrigerator until you're ready to pop it in the oven! I definitely get stuck in that chicken rut and my husband always loves pork, so this looks perfect! You sold me on five ingredients and five minutes of prep time. Another winner for dinner, Blair! Love your photos, too! Blair: This looks wonderful! I served your beef tenderloin with the bourbon glaze for Christmas dinner this year, and it was a huge hit so I know this one will rank right up there. I also enjoy fixing turkey tenderloins quite often. Would this mustard and brown sugar glaze work with turkey? 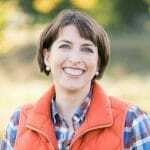 Love your photos of the beautiful Virginia countryside! Yes, I think the mustard and brown sugar glaze would be delicious on chicken or turkey as well! Enjoy! 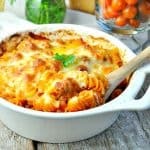 I’m not much of a ,eat eater but I think I’d love this because it seems like it’s so full of flavour! Yum! Hi, Licia! Yes, you can definitely use the Dijon if that’s his preference. Thanks so much Blair, It is my meal plan for the evening. I have saved many of your recipes this past 24 hours! This week is definitely covered by you. Hi, Rebecca! This is one of those great entrees that pairs nicely with just about anything! Oven roasted potatoes or baked potatoes would be good, a loaf of French bread or some dinner rolls would be good, or rice or buttered pasta would work. Basically, whatever your family enjoys! 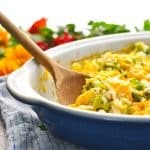 Veggies are flexible, too — I often just go with a simple green salad, but you can also serve roasted broccoli, roasted asparagus, peas, roasted carrots, etc. Just use the search bar on my site (in the righthand side bar) to search for specific recipes or use the drop down menu under “Recipes” to search for the “Sides” category. Hope that helps!